Home > turbo > SOUTH SIDE PERFORMANCE INTRODUCES GTR820RR TURBO UPGRADE FOR NISSAN’S R35 GTR - CAPABLE OF MAKING 820* CRANK HP ! South Side Performance has announced the release of their new upgrade turbos for the R35 GT-R. These turbos are new center sections with re-machined turbine housings, and compressor housings. 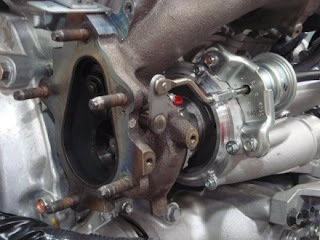 The wastegate acutator is also upgraded to allow for more consistant boost pressures. While this is a good thing, I am interested to see how the clutches handle this upgrade. I have said from the start, making power with the engine is easy. People need to concentrate of the back end of the car. The transmission, the clutches. The center section is a 53.8 on the exhaust side which is a Garrett T28 size. Used on the HKS 2530 though the GT-RS turbo. The compressor side at 68 mm seems like it might be a turned down 2535 or GT-RS compressor wheel. 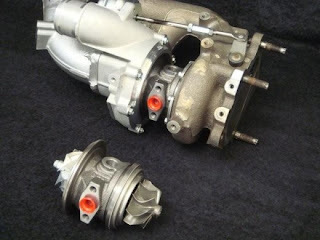 On paper, with a 68 mm wheel the turbos should be good for about 700-750 hp at the engine. A GT-RS with a 71.1 mm compressor wheel, and the same size exhaust wheel is good for about 400 hp each on a RB26. Sioux Falls, South Dakota (January 16, 2009) – South Side Performance is offering, for the first time in the U.S., a turbo upgrade capable of 820 HP* for Nissan’s newest supercar. After months of R and D, South Side Performance have found a turbo combination with greater efficiency, faster spooling, and a stock style fitment for ease of installation. The result is a kit capable of making 820 HP* (when combined with other modifications). Due to the high efficiency of these turbos, GTR owners can run lower boost and make more power. The result is one of the first true big power upgrades available for the R35 GTR. These Garrett ball bearing turbos are a direct bolt-on that utilize CHRA oil lube and are water cooled. They require only one line to be changed and can be properly installed with basic tools and equipment. 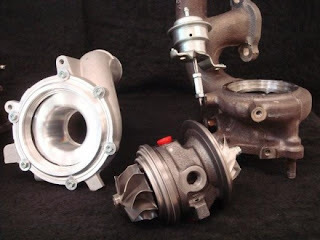 The price of the kit includes the machining each of the stock turbos and installation of an upgraded actuator, 53.8 mm turbine wheel, and 68 mm high pressure billet aluminum compressor wheel which is efficient up to 32 PSI. The turbos were specifically designed to bring bigger power at lower boost and to utilize the fastest spooling turbos available for the size and application. The result is a turbo that makes more power at stock boost levels and starts making boost lower RPM’s than stock. This combination allows your GTR to enjoy the benefits of power lower in the power band that continues all the way to redline. and will be available with exchange of the stock turbos for $6,499.00 or without exchange for an additional core charge. Turnaround time will be minimal, usually about one working week.